Happy Friday, ladies! I took a quick trip to DC for work and landed home late last night. I am super sleepy at work right now but wanted to quickly share my thoughts on a couple of bags that I got to try on this week. Right after I checked into my room, I turned around and headed to Tyson's Galleria. It's an upscale mall located in McLean, VA. This mall is seriously a dream. I had a list of things that I wanted to see in person and was able to check everything off my list. 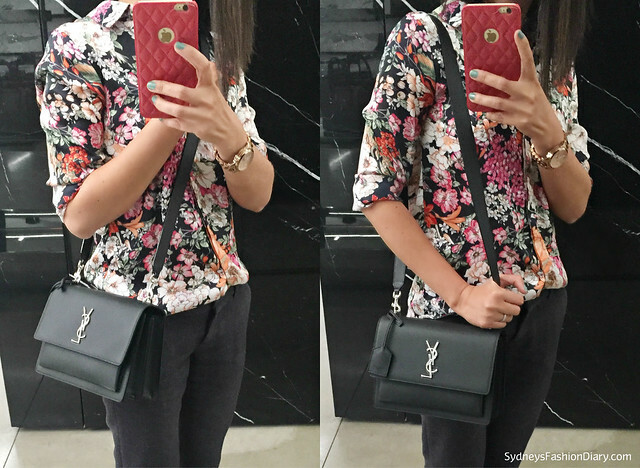 As mentioned last week, I am saving for a Saint Laurent bag. The reason I haven't decided on which one because I haven't seen any of them in person. There isn't a Saint Laurent store in Ohio and my local Saks has a very limited collection of Saint Laurent bags in stock. After seeing and touching a few bags, without a doubt, my next bag would be the Saint Laurent Sunset bag. OMG! It's insanely gorgeous in person. This bag is very new to the market. It was released earlier this year. I spent the last couple of months researching the bag. From what I gathered, this bag is available in 2 sizes: small and medium. Also within each size, there are 2 strap options: the chain strap and the leather strap. I believe the chain chap is a limited edition. It comes in black, burgundy (this is the exact combo I wanted but in a small size), deep blue, blue, red *10% off* and croc embossed. As far as I know, the exact combo I wanted is not available anywhere at this point :( I love the size, the length of the strap and the overall design of the bag. You know I am a sucker for textured leather and this bag is nothing short of amazing. I am glad I got to see it in person. I am planning to purchase the bag early next year but if the exact combo I am looking for is available, I might pull the trigger sooner rather than later. I then made my way to Gucci. I've never been a big fan of Gucci but must admit they're killing it lately (thanks to Alessandro Michele who is the new creative director). One particular bag I have in mind is the Dionysus (only interested in the small size). 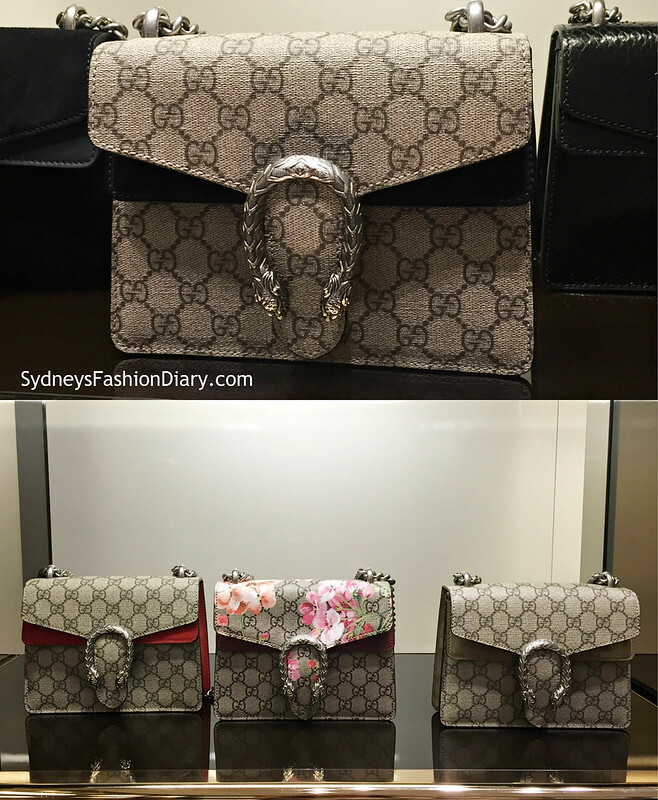 The Gucci Dionysus is causing quite a stir on IG as of late (available in 8 different combinations). I tried on the bag and here are my thoughts. It's super chic in person. I am not always a fan of logos but for some reason, I like this one. Love the combination of treated canvas and suede. Love the hardware, the size and the overall design. However, the chain length is an issue for me. The small size was designed as a crossbody bag. Hence, the length is comically long on my short frame. The only way to make it work is to double up the strap and wear it as a shoulder bag. I don't like the idea of spending over $1500 on a bag and can only wear it one way. The medium size, however, was designed as shoulder bag. The strap length is perfect on me as a shoulder bag as well as a crossbody bag. Although, the size of the bag is not what I wanted. As much as I love the Dionysus, it just simply does not work for me. There you have it! I hope you find this post helpful. If you have any questions regarding these bag, feel free to leave me a comment below. @Cee Thanks, Cee! I thought about it but wasn't sure about my schedule. Definitely next time!